Situated in Miles City, this hotel is 1.2 mi (2 km) from Wibaux Park and within 3 mi (5 km) of Range Riders Museum and Spotted Eagle Recreation Area. Situated in Miles City, this hotel is within 3 mi (5 km) of Wibaux Park, Range Riders Museum, and Spotted Eagle Recreation Area. Situated in Miles City, this hotel is 0.9 mi (1.4 km) from Wibaux Park and within 3 mi (5 km) of Range Riders Museum and Spotted Eagle Recreation Area. Situated in the business district, this motel is within 3 mi (5 km) of Wibaux Park, Range Riders Museum, and Spotted Eagle Recreation Area. Situated in Miles City, this motel is 1 mi (1.6 km) from Wibaux Park and within 3 mi (5 km) of Range Riders Museum and Spotted Eagle Recreation Area. 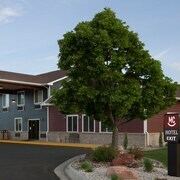 Situated in Miles City, this golf hotel is 0.8 mi (1.3 km) from Wibaux Park and within 3 mi (5 km) of Range Riders Museum and Spotted Eagle Recreation Area. This hotel is in Terry. 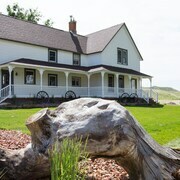 Situated in a rural location, this historic vacation home is within 16 mi (25 km) of Wibaux Park, Range Riders Museum, and Spotted Eagle Recreation Area. The hotel was clean and well taken care of. The staff was extremely friend and helpful. The beds weren't the most comfortableI. I was impressed with their continental breakfast. Probably the best selection and most options of any hotle I have stayed at. Waffles, omlets, cereal, breads, yogurt bar, fresh fruit, etc. I will definitely stay there again!! Where to find Miles City hotels near an airport? Where can I find hotels in Miles City that are near tourist attractions? Are you searching for a hotel or apartment in downtown Miles City? Central Miles City has 7 Expedia-recommended hotels and apartments within 0.1 kilometres (0.06 miles). 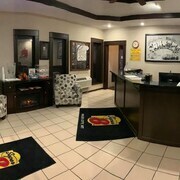 If you are looking for a hotel that is within a short stroll from the center of Miles City, Sleep Inn & Suites Miles City and Comfort Inn Miles City are ideal. 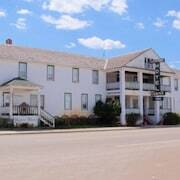 The Best Western War Bonnet Inn is 1 kilometre (1 mile) from the middle of Miles City. Another option is the GuestHouse Inn & Suites Miles City, which is positioned 1 kilometre (1 mile) away. 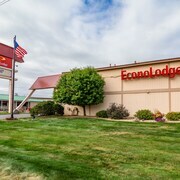 You could also choose to book a room at the Econo Lodge Miles City or the Motel 6 Miles City MT. The broader Eastern Montana region is certainly worth discovering also. Investigate Eastern Montana's farms and also admire the area's prairies. Tourists in this section of United States of America enjoy shore fishing. Before you pack your bags for Miles City, make sure you peruse our Miles City travel guide where you'll be able to learn about the extensive things to see and do this great place has to offer. 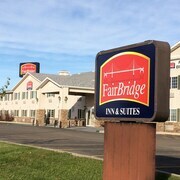 Are there hotels in other cities near Miles City? 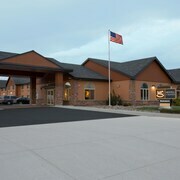 What other types of accommodations are available in Miles City? Explore Miles City with Expedia.ca’s Travel Guides to find the best flights, cars, holiday packages and more!